Mange (Sarcoptes scabiei) under a microscope! Who you calling mangy? I'm just along for the ride! Find out more. Because it produces symptoms similar to those of other skin ailments, scabies can be hard to diagnose correctly. 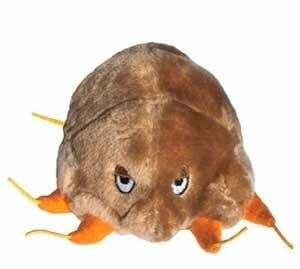 The best thing to do if you think your pet (or you) has scabies is to see a vet or doctor. Treatment can require dips and pills, and it may take up to three weeks for the itching to go away (since white blood cells can take that long to digest the carcasses of the mites). But it certainly beats itching yourself through your shirt – or letting your pooch get hounded by mange! The name comes from Old French roots “mangier”, which means to eat. Adult females are only about 0.3 millimeters in diameter. That’s one third the size of a poppy seed, and the males are half that size! Mange is a skin disease found in dogs. 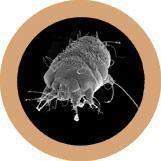 It’s caused by parasitic mites called Sarcoptes scabei, which also cause scabies in humans. It spreads through direct, prolonged skin-to-skin contact. They like a good joint! 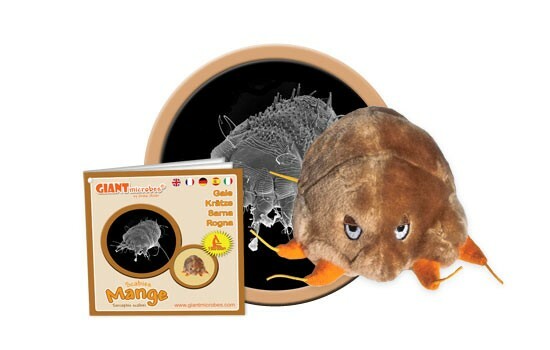 Mange mites prefer the warmest areas of the body, like groin, armpit, and elbows. These eight-legged critters are distant cousins of spiders. They burrow into the top layer of skin to eat and live, causing the skin to react and become extremely itchy. Scabicides are products made to treat scabies mites and eggs. They’re only available by prescription and it should be used on everyone in the house! The disease had been recognized for centuries before the culprit was first identified in 1687 by Giovanni Cosimo Bonomo. These bugs don’t discriminate by age, race, or income levels. That’s what you call an equal opportunity parasite!